I am not sure why but I think my toddler makes more of a mess while eating than either of my other boys did at this age. I think he tries so hard to eat with his fork or spoon that he pushes more off his plate than he eats. I will thrilled to have the chance to review tinytongs , as soon as it arrived I could not wait until meal time. When I first gave him the tinytong it took him a little while to get the hang of using them but when he did he like them. I like the fact that more food was going in his mouth. tinytongs feature an ergonomic, curved shape to perfectly fit tiny hands. The utensil’s non-slip grip is formed to stay in a child’s hand. 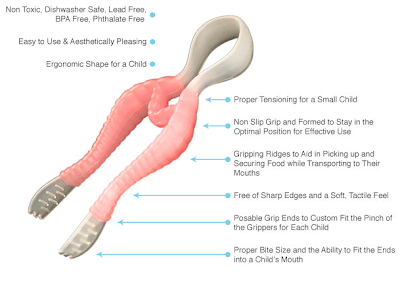 The gripping ridges help the child pick up and secure food while transporting it to his or her mouth. The product’s unique design and size allows for children to effortlessly pick-up bite size pieces of food. When using tinytongs children also strengthen their hand muscles, the same muscles used in later years when learning how to write. 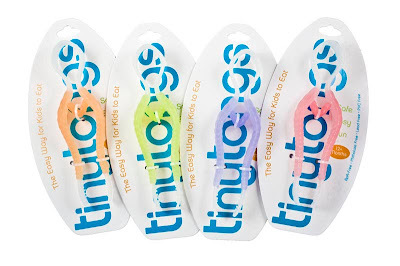 Made from polypropylene and TPE over-molding, tinytongs are non-toxic, lead, BPA and Phtalate Free. tinytongs has passed all voluntary testing as specified in Consumer Products Safety Improvement Act 2008 (CPSIA)(H.R. 4040). tinytongs are suitable for children from age 12+ months through 5 + years They are dishwasher safe, available in stylish colors including pink, purple, orange and green. Recommended retail is $7.99. tinytongs are available online at www.tinytongs.com and at specialty juvenile products stores nationwide. Get your own TinyTongs here... & make sure you use code "lhb20" to get 20% off your purchase! I learned that TinyTongs was founded in 2008 by a mom of 3 and her husband. Visit tinytongs and tell us one fact from their site ! One winner will be chosen ! I will be using a random number generator to select the winner. Contest ends at 11:59pm CST on 12/16/09. If the prize is not claimed in 48 hours a new winner will be chosen. Contest open to U.S. residents only.The winner will be announced in this post(and emailed). Lead Free, BPA Free, Phthalate Free! Tiny tongs are BPA free! There is a Tiny Tongs Blog! Lead free and BPA free! Thanks for the chance. yeah!!! they are dishwasher safe! what a great idea! I love that it is dishwasher safe, bpa free!! I learned that TinyTongs was founded in 2008.